NEW YORK — The R-rated spy comedy "Kingsman: The Golden Circle" displaced the horror sensation "It" as the No. 1 film in North America, while the second "Lego Movie" spinoff of the year didn't assemble the expected audience. 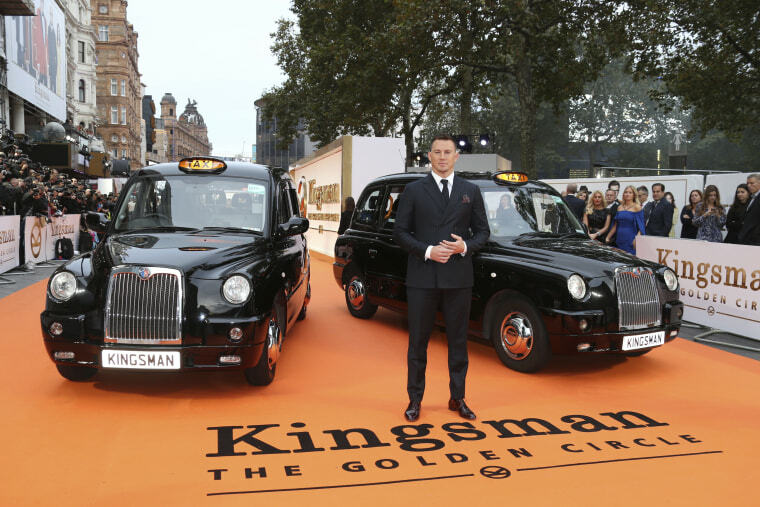 Twentieth Century Fox's "Kingsman" sequel sought to expand on the 2015 original's $36.2 million opening, as well as its $414 million worldwide take. Matthew Vaughn's sequel returned stars Taron Egerton and Colin Firth while adding Channing Tatum, Halle Berry and others. It was made more for audiences than critics, and reviews for the gleefully distasteful spy romp were poor, at 51 percent fresh on Rotten Tomatoes. Fox could celebrate an uptick the second time around, albeit a small one. "The Golden Circle" also debuted with $61 million overseas, giving it a $100 million global weekend. Vaughn is planning a third "Kingsman" film. "We're 7 percent bigger than the last one, which opened on a holiday weekend," said Chris Aronson, distribution chief for Fox. "We grew the franchise. We're very happy." The Stephen King adaptation "It," from Warner Bros. and New Line, may have slightly eaten into the ticket sales for "Kingsman." Few believed that "It" would still be such a draw in its third week of release; horror films usually drop sharply after release. But the film has already established itself as the biggest hit ever in the month of September — a welcome relief to Hollywood after a dismal August. The "Lego Movie" spinoff "The Lego Ninjago Movie," was further off expectations, debuting at $21.2 million. Phil Lord and Chris Miller's "The Lego Movie" — the 2014 hit that made $469 million worldwide — kicked off a bustling franchise. "Ninjago," however, is the second spinoff of the calendar year, following February's "The Lego Batman Movie." That release opened with $35 million and grossed $312 million in total — marks that it appears "Ninjago" will fall well short of. It may be two "Lego" movies in a year were too many. "I was hoping we'd do more. I'm disappointed this weekend didn't come in a little higher," said Jeff Goldstein, Warner Bros.' distribution head. "We know that each one of these 'Lego' movies are different properties. This one played young." In its second week of release, Darren Aronofsky's already infamous psychological thriller "mother!" failed to turn the tide. The film, which was made for $30 million, last week became one of the few movies to receive an "F" CinemaScore on release. The horror parable, starring Jennifer Lawrence, slid to sixth place, with $3.3 million, bringing its two-week haul to $13.4 million. Paramount has proudly defended the film as intentionally divisive, daring filmmaking, the kind seldom produced by major studios. But overall, theaters are suddenly flush again. Although the year is still 4.6 percent behind the pace of 2016, September is up by 20 percent, according to comScore. "The fact that we're sitting here in September on the verge of what looks like a record-breaking month, powered by the unprecedented success of 'It,' tells you how quickly box office fortunes can rise and fall in this marketplace," said Paul Dergarabedian, a senior media analyst for comScore. "Kingsman: The Golden Circle," $39 million ($61 million international). "It," $30 million ($38.3 million international). "The Lego Ninjago Movie," $21.2 million ($10.5 million international). "American Assassin," $6.3 million ($2.7 million international). "mother!" $3.3 million ($4.6 million international). "The Hitman's Bodyguard," $1.9 million ($15.4 million international).